Back in the olden days I used to read Joey Devilla’s blog all the time. He was – and is – known as Accordion Guy and he produced consistently cool content. Well, I just stumbled on him again and found that he’s doing great, philosophical posts on tech. Take his examination of netbooks vs. smartphones, for example. He compares netbooks and smartphones to two brands of fast food pie. 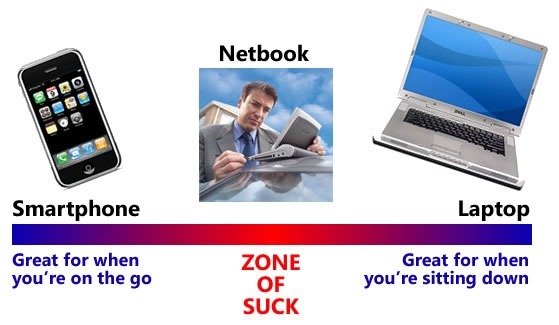 Netbooks are sub-par pies made to look like a real slice of pie – you know you’re not getting good pie but the appearance of a pie shape and crust creates cognitive dissonance and makes you think you’re getting screwed (which, in most cases, you are – netbooks are sub-par notebooks and horrible “communication devices”). Smartphones are like McDonald’s pies in that they don’t look like pie – they look like a pared down and highly subjective vision of pie. You have everything in there – the filling, the crust, whatever else – but you know you’re not buying real pie and you can sit back and “enjoy” it on that level. Netbooks are faking it while smartphones have no pretensions of pie-like goodness. With me so far? This analogy maps directly to netbooks and smartphones. Netbooks look like little laptops but when you try to use them like laptops they fail – the Dell Adamo is an excellent example. They’re not powerful enough to be real laptops yet people expect a little power from something with a screen and a keyboard. The MacBook Air is another example – it’s nigh on unusable in its current configuration yet folks expect a true 2-GHz MacBook crammed into an Air case. This is simply not the situation. Even Intel’s goal of calling them Low Cost Small Notebook PCs is ludicrous. The low-cost is right, but what about low-value? Then you have smartphones. These things SHOULDN’T be internet browsing tablets but they are. I surf more Internet on the iPhone than ever. It’s a great one-off source for a quick fix. When was the last time you put your smartphone down in the kitchen with the browser pointed to a recipe? And when was the last time you put your netbook down next to the flour and eggs? I suspect you used your smartphone more frequently for these one-off tasks than your netbook. When people buy a smartphone, which they’ve been doing like mad, they’re buying their primary mobile phone. It’s the mobile phone and computing platform that they’re using day in and day out and the device that they’re pulling out of their pockets, often to the point of interrupting conversations and crashing the trolley they’re operating. When people buy a netbook, they’re often not buying their primary machine. It’s a second computer, a backup device that people take when their real machine – which is often a laptop computer that isn’t much larger or more expensive – seems like too much to carry. It’s a luxury that people might ditch if the current economic situation continues or worsens and as the differences between laptops and netbooks vanish. Netbooks, as a blend of the worst of both mobile and laptop worlds, will be a transitional technology; at best, they’ll enjoy a brief heyday similar to that of the fax machine. Netbooks are racing to be smartphones and smartphones aren’t racing anywhere – they’re just getting better.